Piaggio, the company that revolutionized personal transport with the launch of the first Vespa model in 1946, continues its streak of innovation with the introduction of the three-wheel scooter, the PIAGGIO MP3. The PIAGGIO MP3 provides safety, road grip and stability levels that no two-wheeler can match. Its power, performance and ease of use make for a very entertaining ride. The two independent, tilting front wheels of the PIAGGIO MP3 re-define the very concept of ride stability to provide an unprecedented riding experience. Take on wet or patchy asphalt, cobblestone streets, train tracks and other tough riding conditions with more confidence and ease than a traditional two-wheeler. With its compact super-scooter size and exceptional maneuverability, the PIAGGIO MP3 is at home in town traffic. It’s a cinch to park: an electro-hydraulic suspension locking system means there is no need to put the vehicle on its stand. 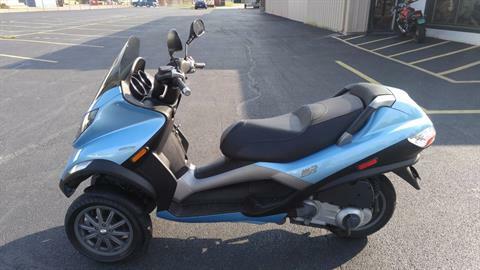 The PIAGGIO MP3 is equally comfortable when heading out of town. Its road grip, cornering safety and tilt angle are unprecedented for a scooter, adding to the pleasure of riding different road surfaces at high speed. Front Wheel Rim: Die-cast aluminum alloy, 12 x 3.00 in. Rear Wheel Rim: Die-cast aluminum alloy, 12 x 3.50 in. CAD-designed down to the last detail, the PIAGGIO MP3 body offered excellent protection starting from the wind tunnel, where it was extensively tested. The front-end design is genuinely innovative in terms of technical features and concept, with car-style bodywork treatment. The headlamps and front fairing merge to form a single unit that enhances the vehicle’s dynamic look as well as providing extra rider protection. Shock-resistant splashguards on either side of the front shield protect the rider and the vehicle. The rear loading section has been designed to offer maximum comfort and storage capacity: a boot lid painted the same color as the bodywork provides access to the under seat storage. A substantial 65-liter (approx. 15-gallons) storage capacity and dual access to the storage area, from the boot lid as well as by flipping up the seat, make the PIAGGIO MP3 extremely practical. The storage area comfortably holds two full-face helmets, a small bag and objects up to about three feet in length. The under seat storage also has a courtesy light and a seat cover for use when parking in rainy weather. A handy remote control button on the ignition key opens the seat lock and the rear boot lid. The rider can also open the fuel cap and rear boot lid with a single twist of the key in the ignition unit. The most advanced calculation programs and three-dimensional measurements were carried out from the initial phase of the PIAGGIO MP3 project to enhance the vehicle’s ergonomics. The result is a vehicle that offers top-of-the-line comfort, safety and ease of use. The front shield provides exceptional protection. An extremely comfortable seat adapted to riders of any size has been made to measure for the PIAGGIO MP3. 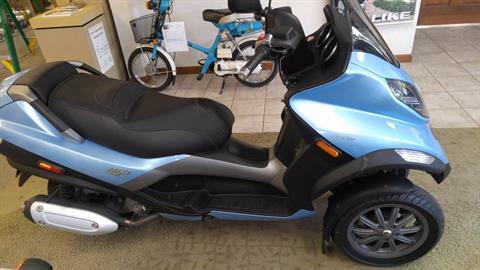 Generous padding and the shape of the built-in backrest provides perfect ergonomical seating, while the saddle height of a mere 30.7-inch from the ground makes the vehicle easy to maneuver in any circumstances. The optimal height difference between the front and the rear parts of the saddle, in addition to the ideally located rear handgrips, ensure passenger comfort and protection. Once the rider has pressed the handlebar switch, the control unit only activates the electro-actuator if the vehicle is traveling at a speed in the range of 5–15 miles per hour. The exact speed at which this takes place depends on the level of deceleration: the greater the deceleration, the higher the speed at which the tilt mechanism locks. Additionally, the mechanism will not lock unless the butterfly valve is closed and the engine is running at below 3000 rpm. To ensure rider safety, the tilt mechanism not only shuts off by pressing the handlebar switch, but is also automatically deactivated if vehicle speed exceeds nine miles per hour, if the butterfly valve is not fully closed or if engine rpm is higher than 3000. A lever on the inside of the front shield actions the parking brake, making it safe to park without using the stand even on sloping ground and making it possible to park the two front wheels where there is a height difference of up to eight inches. The PIAGGIO MP3 comes equipped with the Piaggio Quasar 250 i.e. engine. The Quasar 250 i.e. is the all-new Piaggio four-stroke, four-valve, liquid-cooled engine that meets Euro 3 standards, exceeding even the U.S. EPA and CARB standards. The new Quasar electronic injection series is the result of the Piaggio engine division’s commitment to creating a truly top quality, environment-friendly engine. The advanced closed loop injection with a Lambda sensor, together with a three-way catalytic converter and electronic ignition control system, considerably reduces emissions as well as fuel consumption and provides immediate throttle response. 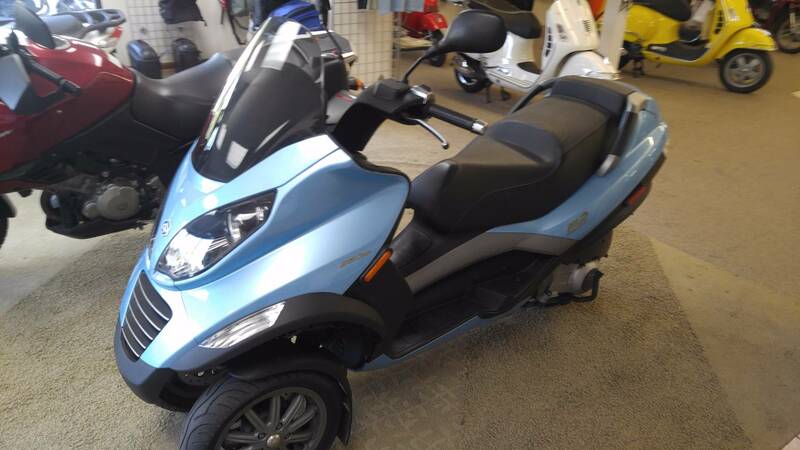 As a result, the PIAGGIO MP3 is fun to ride, quick off the mark in town traffic and comfortable with short motorway trips as well as extended touring. The rear of the MP3 features a single-arm suspension with two dual effect hydraulic shock absorbers, a helicoidal spring and four-position preload. Besides its exceptional stability, the PIAGGIO MP3 also provides brilliant braking thanks to three powerful linked brakes, 240 millimeters in diameter, and the parallelogram suspension. The result is record deceleration (about 8 m per second) with braking space reduced by over 20 percent on normal road surfaces and as much as 24 percent on slippery roads compared to a traditional two-wheel scooter. Tubeless Front: 120 / 70 - 12 in.Rear: 130 / 70 - 12 in.